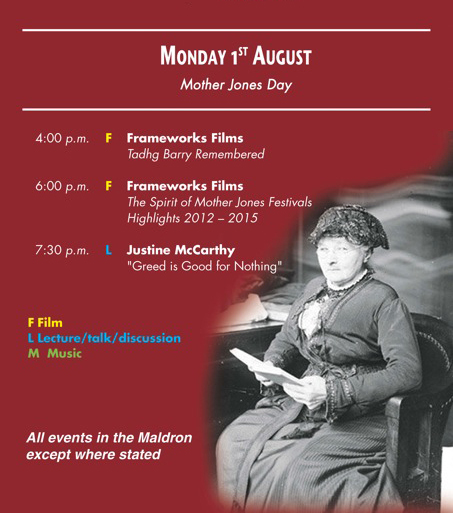 Today, 1st August, is Mother Jones Day in Cork and it is also the final day of the Spirit of Mother Jones Festival 2016. There are just three events on today’s programme all of which will be held at the Maldron Hotel, Shandon. We start at 4.00pm with a showing of Tadhg Barry Remembered – the story of trade unionist, socialist and Irish republican Alderman Tadhg Barry who was shot dead by a sentry at Ballykinlar prison camp in November 1921, just hours before he was due to be released. The documentary was made by Cork based Frameworks Films. At 6.00pm we show The Spirit of Mother Jones Festivals Highlights 2012-2015 which features some of the memorable moments of the first four years of the festival. Our thanks to Frameworks Films who have recorded a huge amount of material at the festival since 2012 and who have similarly created a repository of film recording Cork’s present and recent past which we are certain will become a huge resource for this city. At 7.30pm Bandon born author and award winning journalist Justine McCarthy will deliver a lecture on “Greed is Good for Nothing”. All of today’s events are at the Maldron Hotel, John Redmond Street in the Shandon area of Cork and are completely free.